Irina was born in Siberia ( Russia). Beginning when she was six years old, she studed classical piano. She gratuated from the college of Art in Classical Piano. And then attended Moscow Pedagogical University. Since 1989 Irina has been performing professionaly, including Russian national tours and international performances in Spain (La Coruna, Madrid) and Germany with an art-rock group "Theatre of Pilgrims"with musicians of the group"Two Siberians" She sang in the Magazine Theater in the West Berlin and performed with the American soul singer Robin Hemingway. Irina performed in music clubs in Houston, New York, Baltimore in the USA. Highly talented musician, Irina Zemtsova, releases another fabulous instrumental single, “Improvisation.” This single is focused around the sounds of World Fusion and you will be mesmerized by the palette of richly textured industrial like soundscapes it has to offer. There is a somewhat dark and mysterious tonality which gives this song an interesting appeal. As you listen to this song an angelic like female voice passionately vocalizes a chant while the tribal percussive beats engage a solid and consistent rhythm. There are also delicate strings (some have space like qualities) which weave a mystifying tone and there are also searing guitar riffs. You will thoroughly enjoy the magnetic World Fusion song, “Improvisation,” as it impresses with its electrifying intonation and free flowing melody. "Whispering Your Name" Reviewed by RadioIndy.com! 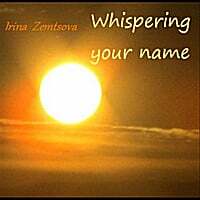 Stunning vocalist, Irina Zemtsova, releases a beautiful Jazz/Pop single, “Whispering Your Name.” This single is bursting with a fiery passion and soul as Zemtsova sings with a polished style an exquisite grace. Her voice has a dynamic power and wonderful range as one can feel her emotive vocals singing a lyrical tale with a magical finesse. The sweet and silky piano that accompanies Zemtsova also imparts a rich and serene ambiance. The melodic melody catches your ear with its touching richness and vocal intensity. This is a great Jazz song where one can sit back and relax to an amazing song. The brilliant single, “Whispering Your Name,” would be an excellent addition to your fine collection of Jazz/Pop music. "Lonely Bird "New Single"" Reviewed by RadioIndy.com!